The issues surrounding Augur’s prediction markets have taken a turn for the worse after Binance’s research team uncovered ‘irregularities’ in the platform. The dwindling volume on Augur has been well documented since the turn of the year, with Coin Rivet reporting a significant drop-off in actively trading markets despite Augur claiming a higher figure in its weekly report. According to data from Veil, open interest on the platform saw a sharp decline on March 18, falling from $927,000 to $567,000 in just 48 hours. And now, Binance Research has produced a report that has brought an increasing number of problems to light. “Though the project has stimulated some questions about the legality of some prediction markets and the actions that they may incentivise, the platform itself still has yet to be thoroughly investigated by many,” Binance Research commented. Technical issues in regards to “market illiquidity, incentive problems, voting, and possible forks” have all been raised by Binance. Another issue that directly affects liquidity is the dispute voting system and the subsequent forks that may be forced. If a market goes into dispute, it will be settled by a democratic vote that sees stakers battle it out to reach a decision. Stakers that back the winning outcome will receive a share of the losing stakes proportional to the amount they contributed. However, if this threshold is pushed on a continuous basis so that an outcome’s stake reaches 2.5% of Augur’s total supply, the chain will undergo a fork. 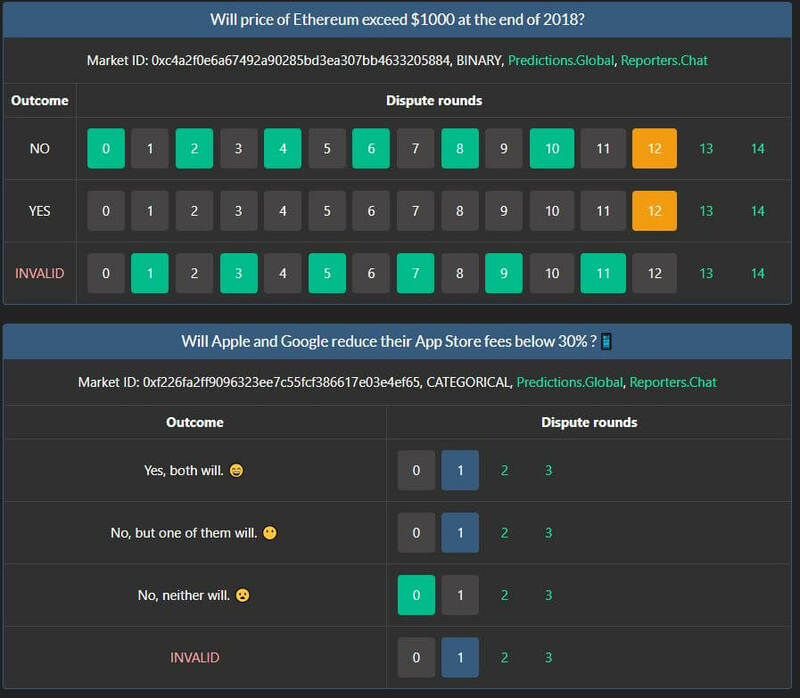 One of Augur’s most active markets in recent months was the Ethereum price prediction market, with three possible outcomes being listed. The market was expected to end “at the end of March 2019”. However, the market expired on April 1, 2019 at 5:59pm, even though the disclosure section stated “at the end of day (UTC) on March 31”. As the contract ended after the end of the day, the entire market could be marked as invalid. This is called a “design flaw attack”, which also happened in 2018 when markets closed one day before the result of the US mid-term elections. It’s worth noting that Augur is still actively traded on Binance among a number of other exchanges, commanding daily trade volume of more than $7.5 million. Augur has performed surprisingly well since the turn of the year despite the ongoing scrutiny, rising from a low of $5.77 in December to today’s price of $15.45.